Okay look, I get it. Food at ballparks have become more than the standard hot dog and ice cream. We’re all trying to come up with new ideas to make a particular ballpark unique. And it’s not just about having the food, it’s about viral marketing of said food. That’s where we come in, as the crazier a food item, the more likely it is that we’re going to blog about it. I think we’re at the point where we’ve run out of ideas, and food companies are left to put random food items on a dartboard, and wherever the five darts hit is what’s going on the hot dog. 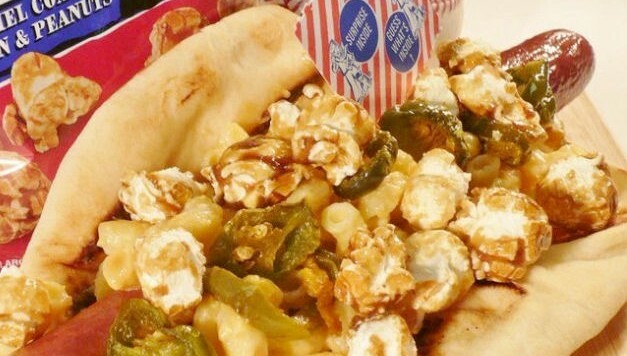 Cracker Jacks, caramel sauce, jalapenos and macaroni and cheese? That’s not a hot dog, that’s a Chopped episode. In fact, we’re going to get to the place where each individual hot dog sold at a stadium is going to come in a mini-basket, and every single hot dog is going to have different ingredients. You won’t know what they are until you open the basket. Because that’s the only thing left that can shock us or get us aroused by food anymore. Somebody needs to tell these people that it’s great if food goes viral, not so much if it gives you virus. It’s still supposed to taste good.